The holidays may be over, but winter is not. With wind, rain, and a constant chill, we need something to warm the soul. That thing is hot chocolate. But with so many different kinds of cocoa, which ones are worth the splurge and which are better left on the shelf? I went out and bought many different flavors and brands of hot chocolate for the purpose of discovering the best one and ranking them for you, our dear readers, from worst to best. Before we got started on the taste test, we looked at each cup and picked our favorites based only on appearance. This hot chocolate was dark in color and looked rich—not to mention the amazing smell of chocolate and peppermint wafting out of the cup. It definitely looked delightful; however, upon tasting it we were very disappointed. We were expecting the sweet cocoa taste with maybe a hint of peppermint but this hot chocolate was so bitter! You also couldn’t really taste the peppermint. I would say that if you really want Starbucks hot chocolate, buy it at the café, not the grocery store. 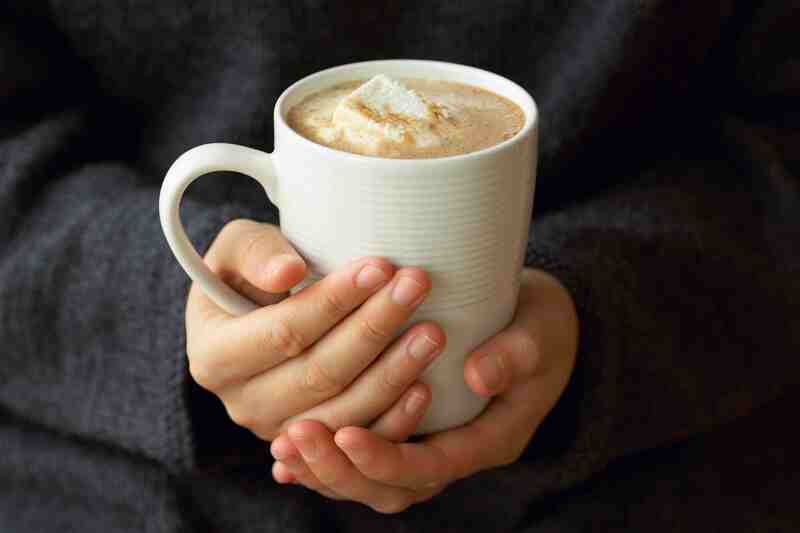 This hot chocolate looked okay—and that is to say just like any other hot chocolate. As soon as the hot water was added, the flavor became evident due to the strong hazelnut smell. I wasn’t too sure what to expect with this one. When we tasted it, we agreed that the hazelnut made it taste more like a coffee than a hot chocolate. Like the other two flavored hot chocolates so far, this one was not exactly what I was expecting. Caramel and chocolate normally go very well together but in this drink, the caramel flavor was overpowering. Even though the flavor was strong, it did not taste bad at all. It was almost delightful, however, it would best be enjoyed in small doses because of how rich the caramel flavor is. This one was pretty good and managed to capture the dark chocolate flavor without becoming too bitter. There was a nice foam on the top when we added the hot water. Overall, not bad choice for those who are looking for the same hot chocolate feeling with half the sweetness. Don’t knock it until you try it—Great Value is a great value. Cheap and bad aren’t synonymous. It captured pretty much everything you would want in a hot chocolate. Sure, it was not quite as decadent as the others, and admittedly pretty watery, that can easily be fixed by using milk instead of water. One of the best parts about this one is that it comes in a big tin and you can add as much or as little powdered mix as you’d like! This one lands at the middle of the list because it tasted good, but there was a certain level of disappointment to it when we were promised chocolate chips and did not receive them. We closely examined the powder and found exactly two chocolate chips in the packet. Two! This one looked and tasted pretty delightful. Overall, however, it was pretty average. That is why it finds itself at the middle of the list: it was not the best but nowhere near the worst. To me, this one was impressive. At first, I wasn’t sure what to expect. When we added the hot water, the cocoa ended up being a muddy gray color—not all that appetizing. Upon tasting it, however, I was pleasantly delighted. The first sip was the best. It tastes just like what it says it does: Oreo and mint. This one is rated number five because while I loved it, my friends hated it. The mint is strong with this one, so if you are not a fan of mint, this one is not for you. Chocolate and vanilla go together, right? In this, and most cases, yes! This hot chocolate had your stereotypical cocoa appearance when we made it (minus the marshmallows). It smelled like vanilla and had a little bit of foam. Overall, a good hot chocolate choice. If you’ve never had white hot chocolate it can be an interesting experience. There were many comments of “It looks like milk!? !”—and yes, it did. If that is off putting for you, then you might not like this one; however, I encourage you to try it. While the appearance was interesting, the cocoa was very delightful. All three of us ranked it high. This one is worth a try for sure if you are looking for an alternative to the classic hot chocolate. When I think of my childhood and holiday traditions this is the cocoa that comes to mind. Even though we did a blind taste test, this one was still ranked high! It had a classic appearance—cocoa brown with mini marshmallows on the top—however, it should be noted that the marshmallows disappear within a minute or so. It tasted sweet and chocolatey. While it is similar to many of the choices on this list, I think the added flavor from the marshmallows (or nostalgia) has something to do with its rank. Yes, the cheap Cocoa Cone that you see everywhere around the holidays was the most delightful of the hot cocoas. No one was more shocked than us. All around this one was the favorite!?! Out of all of them!?! Yes. This is the only one that came with decent marshmallows, which probably had something to do with it. The marshmallows were a little stiff but melted nicely into the hot chocolate. The flavor of the hot chocolate was surprisingly rich—delightful, even. Overall, this one was arguably and hilariously the best one we tasted. When it comes to hot chocolate there are many, many choices. Everyone has different tastes and special ways of making their favorite cocoa. However, I encourage you to go out and try something new! Maybe you’ll be pleasantly surprised. *It should be noted that each hot chocolate sample was made with water, not milk, to make them all even. We also did not add marshmallows unless they came in the package. I’m finally free from school work. Now what do I do? April 30, 2014 Josh Fisher Comments Off on I’m finally free from school work. Now what do I do?